In the last 4 days of writing for the book, so this means I'm 1) exhausted 2) procrastinating by blogging and 3) really don't have time to write much. So you get piccies! Rodger's 20th Birthday. 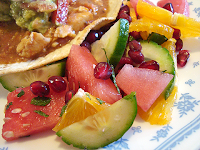 He wanted a Mexican meal - Chicken and Refried Beans in tortilla 'baskets', Guacamole, plus Christmas Salad (watermelon, pomegranate seeds, orange, cucumber, fresh mint, and a splash of lime juice - delish!). Cheers! 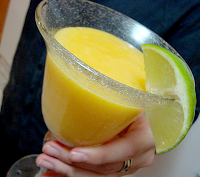 Mango Daiquiris all round! Our 19-year-old Simpson top-loader washing machine (that we got second-hand 13 years ago) finally gave up the ghost. Thank goodness for post-Christmas sales. 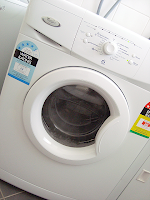 Introducing Washy, our new Whirlpool front loader machine, with 4.5 water efficiency stars and a 3 star energy rating! It only uses 64 litres per wash!! W00t! Looks good on, too (6 ply Opal). 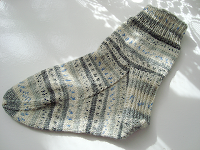 I'm past the heel on the second sock already, too. 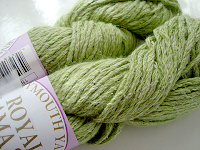 6ply knits up so quickly! We hold our 'Christmas' on New Year's Eve - mainly so we can spend 25th Dec with my horrid FIL and not feel like he's ruined our Christmas; plus we can have Rodger's birthday celebrations first, shop at the post-Christmas sales, and generally diffuse a lot of the 'Christmas madness' stress. It works well. 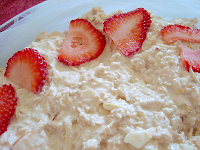 The day always begins with Bircher Muesli - a quadruple batch! My mum's recipe from my childhood ... yum. Oatmeal, freshly squeezed orange and lemon juice, almonds, grated apples, plain yoghurt, brown sugar, and more, soaked overnight. Perfect comfort food. 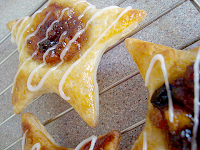 Fruit Mince Stars. Super easy, fast, and tasty! We'll make these again! Hubby got me this wonderful little 'glasshouse' (really a plastic tubing & vinyl house) - just what I need for raising my seedlings! I clearly need some practice / advice though - this is what happened to my lovingly raised 2-month old tomato seedlings after being overnight in the glasshouse ... the early morning sun completely fried them. I probably should have left the door rolled up. Or something. Cry cry cry!! FIL is still in hospital - hoping to get out next week. He got a 'day pass' for Christmas Day, and spent the afternoon with us. The nurses were happy to have a break from him for a while - they said "You can keep him!" somewhat hopefully when Hubby picked him up. The Aged Care Assessment thing is happening next Monday. Monday - ah next Monday. The Deadline. I've got 8 puzzles to go - 5 are quick, but 3 are quizzes, which are not quick. But the end is in sight, and I'm on track. Of course, there will be no real break, as I'll go straight into 4 weeks of Author Review, editing 1/4 of the book each week. But at least the writing work will all be done! Yay! Hope you're well and enjoying a good break at the start of 2009! Dear Jejune - Happy New Year and good luck with everything for 2009. The TS14+ collection is stunning! Lucky you. Thanks for taking the time out from the festivities and work to update us! Lovely piccies. Food looks delish! And sock nice, too. LOL about what the nurses said about keeping FIL! Yes, all good things for 2009 to you and yours. What beautiful meals you produce! 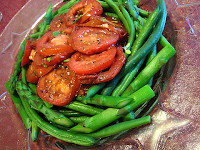 Every greenbean is aligned perfectly. Your attention to detail blows me away. Lovely pressies. All the best for a splendid 2009.
it all looks lovely Jejune. 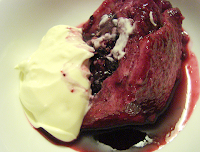 So great your first summer pudding turned out so well. It's a long standing favourite in our house! I have one of those green houses and learned the hard way in the first year not to roast my seedlings. This time of year they don't need to be in there, once the frost is over. Or if they're in there and under partial shade, like under a tree or something, they should be ok as long as they are heavily watered every day. And I think I have that very washer. And watermelon. I miss watermelon. It's only started to be winter so I have a while to go. With food like that....may I please come to your house for my next birthday? I couldn't help but point out that the Yarn Harlot's washing machine also gave up the ghost around the same time. Coincidence ? Oh my, all the food sound and looks so good. It is all food I never heard of and the combinations sound so good. Love the new washer. I got myself a full sized stacking waser/dryer. I could not beleive how fast it took to wash & dry a load. By now you know that. Love the jewerly at TS14+, but I do not think they ship to USA. OK, on to your next post.